Department of Family Medicine (Bell), University of Alberta, Edmonton, Alta. ; Public Health Agency of Canada (Connor Gorber, Shane, Dunfield), Ottawa, Ont. ; Faculty of Health Sciences (Joffres), Simon Fraser University, Burnaby, BC; Departments of Internal Medicine and Community Health Sciences (Singh), University of Manitoba, Winnipeg, Man. ; Departments of Family Medicine and Community Health Sciences (Dickinson) and Office of the Associate Dean — Research (Tonelli), University of Calgary, Calgary, Alta. ; Department of Family Medicine (Shaw), McMaster University, Hamilton, Ont. Cases of and deaths from prostate cancer, with associated age-standardized incidence and mortality (per 100 000 men), among Canadian men aged 45 years and older. Age was standardized to the 1991 Canadian population. Incidence data were not available for Quebec from 2008 to 2010; therefore, the population denominator for age-standardized incidence was adjusted and case counts for 2008–2010 were omitted. Mortality data were available only to 2009. The Canadian Task Force on Preventive Health Care is an independent panel of volunteer clinicians and methodologists that makes recommendations about clinical manoeuvres aimed at primary and secondary prevention (www.canadiantaskforce.ca). Work on each set of recommendations is led by a workgroup of two to six members of the task force. Each workgroup establishes the research questions and analytical framework for the guideline. More information about the task force’s methods can be found elsewhere12 and on the task force website (http://canadiantaskforce.ca/methods/methods-manual/). The development of these recommendations was led by a workgroup of six members of the task force and scientific staff at the Public Health Agency of Canada. Guideline development was based on an analytical framework (Appendix 1, available at www.cmaj.ca/lookup/suppl/doi:10.1503/cmaj.140703/-/DC1) that established the overall purpose and background of the guideline, framed the literature review and outlined the key and contextual research questions. The analytical framework was reviewed by all members of the task force and underwent external review by national and international stakeholders with expertise in prostate cancer before guideline development. The key and contextual questions in the analytical framework examined the benefits and harms of PSA screening with or without digital rectal examination and the benefits and harms of treatment of prostate cancer on decreasing prostate cancer mortality and all-cause mortality. The Evidence Review and Synthesis Centre at McMaster University (Hamilton, Ont.) conducted a systematic review of the available evidence with the aid of a urologist, who served as an independent technical advisor, and scientific staff at the Public Health Agency of Canada.13 The systematic review was done according to the final, peer-reviewed protocol (http://canadiantaskforce.ca/perch/resources/ctfphc-prostate-cancer-screening-protocol.pdf) of the analytical framework and followed the methods described in the procedure manual.14 Because a previous search by the US Preventive Services Task Force was used to identify data published before 2007, the timeline to review the benefits of screening was extended from Jan. 1, 2007, to Nov. 30, 2013. The search for harms data went from 2003 to Nov. 30, 2013. The timeline for the treatment review was from Jan. 1, 2007, to Nov. 30, 2012. The search was updated Aug. 15, 2014, to include eligible trials that reported extended follow-up. Databases searched included PubMed, Ovid MEDLINE, MEDLINE, the Cochrane Central Register of Controlled Trials and the Cochrane Database of Systematic Reviews. The methods and findings of the systematic review13 can be obtained at www.canadiantaskforce.ca. The task force used the Grading of Recommendations Assessment, Development and Evaluation (GRADE) system to determine the quality of evidence and strength of recommendations (Box 1).15 The protocol, systematic review and guideline underwent external peer review by academic and clinical experts. Recommendations are graded according to the Grading of Recommendations Assessment, Development and Evaluation (GRADE) system.15 GRADE offers two strengths of recommendation: strong and weak. The strength of recommendations is based on the quality of supporting evidence, the degree of uncertainty about the balance between desirable and undesirable effects, the degree of uncertainty or variability in values and preferences, and the degree of uncertainty about whether the intervention represents a wise use of resources. Strong recommendations are those for which the task force is confident that the desirable effects of an intervention outweigh its undesirable effects (strong recommendation for an intervention) or that the undesirable effects of an intervention outweigh its desirable effects (strong recommendation against an intervention). A strong recommendation implies that most individuals will be best served by the recommended course of action. Weak recommendations are those for which the desirable effects probably outweigh the undesirable effects (weak recommendation for an intervention) or the undesirable effects probably outweigh the desirable effects (weak recommendation against an intervention) but appreciable uncertainty exists. A weak recommendation implies that most men would want the recommended course of action but that many would not. For clinicians, this means they must recognize that different choices will be appropriate for each person, and they must help each patient arrive at a management decision consistent with his values and preferences. Policy-making will require substantial debate and involvement of various stakeholders. Weak recommendations result when the balance between desirable and undesirable effects is small, the quality of evidence is lower, or there is more variability in the values and preferences of patients. The literature search for the systematic review identified six randomized controlled trials (RCTs).16–21 Because three of the trials16–18 were considered to have a high risk of bias, evidence from these trials was not considered for this guideline. None of the excluded studies showed benefit from prostate cancer screening. Findings from all sites of the European Randomized Study of Screening for Prostate Cancer (ERSPC),19 a multi-country study, were considered together when we formulated the recommendations. A small absolute reduction in prostate cancer mortality was reported in the ERSPC study.19 The investigators found that the risk of death from prostate cancer was reduced in the screening group (relative risk [RR] 0.79, 95% confidence interval [CI] 0.69–0.91; absolute risk reduction 0.128%, or 13 lives saved per 10 000 men invited for screening), with a pretrial PSA testing rate of 20%.13,19 However, there was evidence of heterogeneity between study centres, with some finding that screening reduced prostate cancer mortality while others did not. In contrast, the Prostate, Lung, Colorectal, and Ovarian Cancer Screening Trial (PLCO) found no effect of screening on prostate cancer mortality (RR 1.09, 95% CI 0.87–1.36; 0 deaths from prostate cancer prevented per 10 000 invited for screening).21 Participants in the PLCO trial had a high rate of pretrial PSA testing (52%), but sensitivity analysis found no effect of pretrial PSA testing on the results. High rates of opportunistic PSA screening were observed in the control group, however, which decreased the opportunity to show a beneficial effect of screening. Therefore, although the lack of benefit observed in the PLCO trial reduces confidence that PSA screening truly does reduce prostate cancer mortality, the task force placed relatively more weight on the findings of the ERSPC study. The rate of false-positive results varies depending on the PSA test threshold, ranging from 11.3% of all screened men at a threshold of 4.0 ng/mL to 19.8% at a threshold of 3.0 ng/mL.23,24 The PLCO study used a threshold of 4.0 ng/mL (annual screening), and most sites in the ERSPC study used a threshold of 3.0 ng/mL (screening every 4 yr). Lower thresholds can increase the number of cases of cancer detected, but they also increase the risk of a false-positive result and diagnosis of indolent tumours of no clinical significance. No level of PSA excludes prostate cancer.25,26 Other factors that increase the risk of a false-positive PSA test result include urinary tract infection and benign prostatic hypertrophy. Men who have a positive PSA test result are typically invited for further testing, which usually includes prostate biopsy. Depending on the chosen strategy for the PSA test threshold and the frequency of testing, men who undergo PSA screening could potentially have multiple biopsies over time, thereby increasing their risk of harms. Radical prostatectomy, radiation therapy and androgen deprivation therapy are the most common treatments of prostate cancer and are associated with potential harms. In RCTs that compared radical prostatectomy with watchful waiting, men in both study arms had the potential to receive other treatments, which made it difficult to estimate the harms from a specific treatment. After 12.4 years of follow-up in the Scandinavian Prostate Cancer Group (SPCG-4) study, the cumulative prevalence of erectile dysfunction was 84% in the intervention group and 80% in the watchful-waiting group; the rates of urinary leakage were 41% and 11%, respectively.38 After 2 years of follow-up in the Prostate Cancer Intervention Versus Observation Trial (PIVOT), men who underwent radical prostatectomy had higher rates of urinary incontinence (17.1% v. 6.3%) and erectile dysfunction (81.1% v. 44.1%) than men in the observation arm.28 Cohort studies consistently reported an increased risk of erectile dysfunction associated with radical prostatectomy (RR 1.6, 95% CI 1.3–1.8, affecting 23.4% or 234 per 1000 of men) compared with no treatment.39–43 Both RCTs28,38 and cohort studies39–42 found that radical prostatectomy increased the risk of urinary incontinence compared with watchful waiting (meta-analysis of trial data: RR 3.2, 95% CI 2.3–4.6; 17.8% of men or 178 per 1000 affected13). The studies included in the systematic review used various strategies for following control participants that often were not clearly defined.13 It was unclear which (if any) control groups were followed with active surveillance (continued monitoring with repeat PSA testing, and biopsy and treatment depending on the test results48) or with watchful waiting (no active treatment; treatment of symptoms only as they progress48). A summary of the recommendations is shown in Box 2, and a clinical summary is provided in Appendix 3 (www.cmaj.ca/lookup/suppl/doi:10.1503/cmaj.140703/-/DC1). The task force based the recommendations on the overall balance between the possible benefits and harms of PSA screening (with or without digital rectal examination), weighing the possible benefits against potential harms of early diagnosis and treatment of prostate cancer. There is (a) no evidence that PSA screening reduces overall mortality among men of any age; (b) conflicting evidence suggesting a small and uncertain potential reduction in prostate cancer mortality among men aged 55–69 years; (c) no convincing evidence of a reduction in prostate cancer mortality in any other age group; and (d) consistent evidence that screening and active treatment lead to harm. The recommendations apply to all men without a previous diagnosis of prostate cancer. Groups at increased risk of prostate cancer and of dying from it include men of black race and men with a family history of prostate cancer. There are no trial data showing that the benefits or harms of screening differ in these populations, as compared with men in the general population. However, clinicians may wish to discuss the benefits and harms of screening with men at increased risk of prostate cancer, with explicit consideration of their values and preferences. Recommendations do not apply to the use of the PSA test for surveillance after diagnosis or treatment of prostate cancer. This recommendation is based on the low incidence of prostate cancer and prostate cancer mortality, and the lack of evidence for benefit of screening in this age group, as well as the evidence of harms. This recommendation places a relatively low value on a small and uncertain potential reduction in prostate cancer mortality, and a relatively higher value on the risk of a false-positive result, unnecessary biopsies, overdiagnosis of prostate cancer and harms associated with unnecessary treatment. The risks and benefits of PSA screening and its potential consequences should be discussed with each patient in the context of his preferences. Men who place a high value on a small potential reduction in mortality and are less concerned with undesirable consequences may choose to be screened. This recommendation reflects the lower life expectancy and the lack of evidence for benefit of screening in this age group as well as the evidence of harms. For men aged less than 55 years and those 70 years and older, the strong recommendations against PSA screening reflect our certainty that the potential harms of screening outweigh the benefits given the current state of knowledge. Because of recent efforts to encourage screening for prostate cancer, some men may be interested in PSA screening despite the current recommendations. Evidence suggests that a patient’s perceived vulnerability to the disease, as a result of family history or otherwise, and physician recommendation are both associated with patient request for screening with the PSA test.50 Although high-quality evidence on the best way to facilitate informed decision-making about prostate cancer screening is lacking, such discussions should aim to elicit the knowledge, preferences and values of patients who ask about PSA screening.51,52 Many men view screening positively but are unaware of the potential harms.53 In addition to a focus on the patient’s values and preferences, informed decision-making requires practitioners to distinguish between the benefits and harms of screening, subsequent investigations and treatment, including an overview of diagnostic and therapeutic options in the event that the PSA test result is abnormal. The task force recognizes that some men may place greater value on the potential benefits of screening than on the harms and risks associated with diagnosis and treatment and may choose to be screened with the PSA test. To facilitate informed decision-making about screening for prostate cancer, the task force has developed decision aids and tools that are available at www.canadiantaskforce.ca. The task force did not consider the costs of screening or treatment of prostate cancer when formulating these recommendations. Suggested performance measures include rates of PSA testing and subsequent follow-up, and the degree to which men who request screening were accurately informed of the risks and benefits of screening (ideally using an evidence-based decision aid). Incidence and mortality data related to prostate cancer should continue to be monitored at the provincial, territorial and national levels. Several tests to supplement the PSA test in screening for prostate cancer have been developed in recent years. These tests are intended to detect cell activity in potentially malignant cells and are aimed at assessing risk during various stages, such as after a positive biopsy result,62 after a negative biopsy result63–65 and after surgery.66 These tests measure molecular markers, which typically indicate patterns of gene activity, such as expression of the PCA3 gene and other DNA mutations, which occur in the presence of a malignant tumour. We recommend that such tests not be used until sufficient evidence is available on their diagnostic performance, harms and benefits. Future research may be best focused on finding alternatives to the PSA test for prostate cancer screening and reducing inappropriate PSA testing. It has been suggested that baseline PSA testing could help to assess the future risk of death or metastasis from prostate cancer (which could support risk-based screening67,68), but more work is needed before this approach could be recommended. Magnetic resonance imaging and clinical decision rules are also promising approaches to improving the risk:benefit ratio of screening, but they have not been tested in rigorous randomized trials. Future research should also develop methods to identify the subset of men with prostate cancer in whom clinically relevant disease would develop (in the absence of treatment). Altering PSA thresholds or screening intervals, as well as uncoupling screening from treatment (because some men may opt for watchful waiting or active surveillance instead of active treatment), may favourably change the risk:benefit ratio of PSA screening; however, more research is needed to test this hypothesis. Trials investigating the benefits of PSA screening among men with a family history of prostate cancer or men of black race would be helpful to determine whether screening in these high-risk populations is warranted. Finally, randomized trials should compare watchful waiting or active surveillance, or both, with treatment with a curative intent. Available evidence does not conclusively show that PSA screening will reduce prostate cancer mortality, but it clearly shows an increased risk of harm. The task force recommends that the PSA test should not be used to screen for prostate cancer. The implication of the strong recommendations against screening men less than 55 years of age and those 70 years of age and older is that clinicians should not routinely discuss screening with men in these age groups unless the topic is raised by the patient. The implication of the weak recommendation against screening men aged 55–69 years is that clinicians who believe a patient places a high value on the small potential benefit of screening and is less concerned about the harms may wish to discuss the benefits and harms of screening with the patient so that he can make an informed decision about whether to be screened. Any use of PSA testing to screen for prostate cancer requires a thoughtful discussion between the clinician and the patient about the balance between unclear benefits and substantial harms. The prevalence of undiagnosed prostate cancer at autopsy is high and increases with age (> 40% among men aged 40–49 yr to > 70% among men aged 70–79 yr). Only a small proportion of men with prostate cancer have symptoms or die from the disease; most prostate cancers are slowly progressive and not life threatening. Screening with the PSA test may lead to a small reduction in prostate cancer mortality but not a reduction in all-cause mortality. Thresholds for PSA of 2.5 to 4.0 ng/mL are commonly used for screening; lower thresholds increase the probability of false-positive results, and no threshold completely excludes prostate cancer. Harms associated with PSA screening (e.g., bleeding, infection, urinary incontinence, a false-positive result and overdiagnosis) are common. The PSA test should not be used for screening without a detailed discussion with the patient, ideally with the use of decision aids to facilitate comprehension. The authors acknowledge Ali Usman and Donna Fitzpatrick-Lewis, members of the Evidence Review and Synthesis Centre research team who conducted the systematic review upon which these recommendations were based; the staff at the Prevention Guidelines Division and the Surveillance Division of the Public Health Agency of Canada; and the reviewers whose comments helped to improve the quality of this manuscript (Kami Kandola, Council of Chief Medical Officers of Health liaison representative; Scott D. Smith, College of Family Physicians of Canada; Anthony B. Miller, Dalla Lana School of Public Health, University of Toronto; Chris Del Mar, Bond University; Robert Nuttall, Canadian Cancer Society; Barbara Foster, Health Canada; Amanda Shaw, Public Health Agency of Canada; and Alexandra Barratt, School of Public Health, University of Sydney). Contributors: Neil Bell, Sarah Connor Gorber, Amanda Shane, James Dickinson, Lesley Dunfield and Marcello Tonelli contributed substantially to the study concept and design, and the analysis and interpretation of the evidence, and drafted the manuscript. Michel Joffres contributed to the analysis and interpretation of data and revised the draft. Harminder Singh and Elizabeth Shaw contributed to the interpretation of data and revised the draft. All of the authors approved the final version of the manuscript and agree to act as guarantors of the work. Funding: Funding for the Canadian Task Force on Preventive Health Care is provided by the Public Health Agency of Canada and the Canadian Institutes of Health Research. The views of the funding bodies have not influenced the content of the guideline; competing interests have been recorded and addressed. The views expressed in this article are those of the authors and do not represent those of the Public Health Agency of Canada. Canadian Cancer Society Advisory Committee on Cancer Statistics. Canadian cancer statistics 2013. Toronto: Canadian Cancer Society; 2013. ISSN 0835-2976. Canadian cancer statistics 2011 [Table 6.1]. Toronto: Canadian Cancer Society; 2011. Available: www.cancer.ca/~/media/cancer.ca/CW/cancer%20information/cancer%20101/Canadian%20cancer%20statistics/Canadian-Cancer-Statistics-2011-EN.pdf (accessed 2014 Sept. 22).
. Evidence supports a faster growth rate and/or earlier transformation to clinically significant prostate cancer in black than in white american men, and influences racial progression and mortality disparity. J Urol 2010;183:1792–6.
. Overdiagnosis due to prostate-specific antigen screening: lessons from the US prostate cancer incidence trends. J Natl Cancer Inst 2002;94:981–90.
. Overdiagnosis and overtreatment of early detected prostate cancer. World J Urol 2007;25:3–9.
. Prostate cancer screening: What we know, don’t know, and believe. 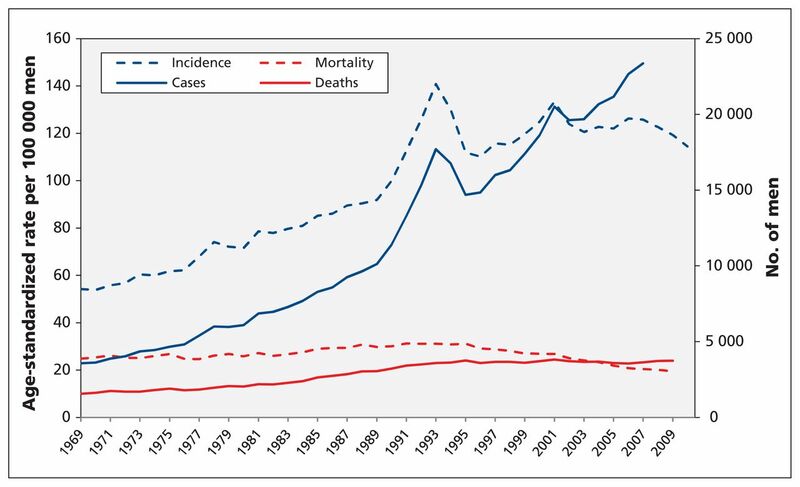 Ann Intern Med 2012;157:135–6.
. Prostate cancer epidemic in sight? Eur Urol 2012;61:1093–5. US Preventive Services Task Force. Screening for prostate cancer: US Preventive Services Task Force recommendation statement. Ann Intern Med 2012;157:120–34.
. PSA screening and prostate cancer mortality. CMAJ 2002;166:586–91.
. International variation in prostate cancer incidence and mortality rates. Eur Urol 2012;61:1079–92. Canadian Task Force on the Periodic Health Examination. Screening for prostate cancer. In: The Canadian guide to clinical preventive health care. Ottawa: Canada Communication Group; 1994:812.
. Process for guideline development by the reconstituted Canadian Task Force on Preventive Health Care. CMAJ. 2012;184:1575–81. , editors. Screening for prostate cancer with prostate specific antigen (PSA) and treatment of early-stage or screen-detected prostate cancer: a systematic review of the clinical benefits and harms. Ottawa: Canadian Task Force on Preventive Health Care; 2013. The Canadian Task Force on Preventive Health procedure manual. Ottawa: Canadian Task Force on Preventive Health Care; 2014.
. GRADE handbook for grading quality of evidence and strength of recommendations. Version 3.2 [updated March 2009]. GRADE Working Group; 2009.
. 15-year followup of a population based prostate cancer screening study. J Urol 2009; 181:1615–21.
. Randomised prostate cancer screening trial: 20 year follow-up. BMJ 2011;342:d1539.
. Screening decreases prostate cancer mortality: 11-year follow-up of the 1988 quebec prospetive randomized controlled trial. Prostate 2004;59:311–8.
. Screening and prostate cancer mortality: results of the European Randomised Study of Screening for Prostate Cancer (ERSPC) at 13 years of follow-up. Lancet 2014; Aug. 6 [Epub ahead of print].
. Mortality results from the Göteborg randomised population-based prostate-cancer screening trial. Lancet Oncol 2010;11:725–32.
. Prostate cancer screening in the randomized Prostate, Lung, Colorectal and Ovarian cancer screening trial: mortality results after 13 years of follow-up. J Natl Cancer Inst 2012;104:125–32. Prostate cancer screening (PDQ®). Bethesda (MD): National Cancer Institute; 2014. Available: www.cancer.gov/cancertopics/pdq/screening/prostate/HealthProfessional/page1 (accessed 2014 Sept. 9).
. Cumulative incidence of false-positive results in repeated, multimodal cancer screening. Ann Fam Med 2009; 7:212–22.
. False-positive screening results in the European Randomized Study of Screening for Prostate Cancer. Eur J Cancer 2011;47:2698–705.
. Prevalence of prostate cancer among men with a prosate-specific antigen level < or = 4.0 ng per milliliter. N Engl J Med 2004;350:2239–46.
. The influence of finasteride on the development of prostate cancer. N Engl J Med 2003;349:215–24.
. Radical prostatectomy versus watchful waiting in early prostate cancer. N Engl J Med 2011; 364:1708–17.
. Radical prostatectomy versus observation for localized prostate cancer. N Engl J Med 2012; 367:203–13.
. Cancer-specific and other-cause mortality after radical prostatectomy versus observation in patients with prostate cancer: competing-risks analysis of a large north American population-based cohort. Eur Urol 2011;60:920–30.
. 13-year outcomes following treatment for clinically localized prostate cancer in a population based cohort. J Urol 2007;177:932–6.
. Short- and long-term mortality with localized prostate cancer. Arch Intern Med 2007; 167:1944–50.
. Outcomes in localized prostate cancer: National Prostate Cancer Register of Sweden follow-up study. J Natl Cancer Inst 2010;102:950–58.
. Long-term survival in men with high grade prostate cancer: a comparison between conservative treatment, radiation therapy and radical prostatectomy — a propensity scoring approach. J Urol 2007;177:911–5.
. Radiotherapy and survival in prostate cancer patients: a population-based study. Int J Radiat Oncol Biol Phys 2009;73:15–23.
. Survival associated with treatment vs observation of localized prostate cancer in elderly men. JAMA 2006;296:2683–93.
. Factors associated with initial treatment and survival for clinically localized prostate cancer: results from the CDC-NPCR Patterns of Care Study (PoC1). BMC Cancer 2010;10:152.
. Competing-risks mortality after radiotherapy vs. observation for localized prostate cancer: a population-based study. Int J Radiat Oncol Biol Phys 2012;84: 95–103.
. Long-term quality-of-life outcomes after radical prostatectomy or watchful waiting: the Scandinavian Prostate Cancer Group-4 randomised trial. Lancet Oncol 2011;12:891–9.
. Patient satisfaction with treatment decisions for clinically localized prostate carcinoma: results from the prostate cancer outcomes study. Cancer 2003;97:1653–62.
. Health-related quality of life after treatment for localized prostate cancer. Cancer 1995;75:2000–3.
. Effect of treatment on quality of life among men with clinically localized prostate cancer. Med Care 2001;39:243–53.
. Quality of life three years after diagnosis of localised prostate cancer: population based cohort study. BMJ 2009;339:b4817.
. The development of erectile dysfunction in men treated for prostate cancer. J Urol 2001; 165:430–5.
. 30-day mortality and major complications after radical prostatectomy: influence of age and comorbidity. J Natl Cancer Inst 2005;97:1525–32.
. Intraoperative and perioperative morbidity of contemporary radical retropubic prostatectomy in a consecutive series of 1243 patients: results of a single center between 1999 and 2002. Eur Urol 2003; 43:113–8.
. Comprehensive standardized report of complications of retropubic and laparoscopic radical prostatectomy. Eur Urol 2010; 57:371–86.
. Quality of life and symptoms in a randomized trial of radiotherapy versus deferred treatment of localized prostate carcinoma. Cancer 2001;92:3111–9. Active surveillance. Toronto: Prostate Cancer Canada. Available: http://prostatecancer.ca/Prostate-Cancer/Treatment/Active-Surveillance#.Uysm3qhdV8E; 2013 (accessed 2014 Sept. 9). Risk factors for prostate cancer. Toronto: Canadian Cancer Society. Available: www.cancer.ca/en/cancer-information/cancer-type/prostate/risks/?region=on;2013 (accessed 2014 Sept. 9).
. The decision-making process in prostate cancer screening in primary care with a prostate-specific antigen: a systematic review. J Geriatr Oncol 2011;2:161–76.
. Overdiagnosis in cancer. J Natl Cancer Inst 2010; 102:605–13.
. Exploring patient perceptions of PSA screening for prostate cancer: risks, effectiveness, and importance. Can Fam Physician 2012;58:e502–7.
. Prostate cancer screening: Canadian guidelines 2011. Can Urol Assoc J 2011;5:235. Prostate-specific antigen (PSA) test. Toronto: Canadian Cancer Society; 2014. Available: www.cancer.ca/en/cancer-information/diagnosis-and-treatment/tests-and-procedures/prostate-specific-antigen-psa/?region=on (accessed 2014 Sept. 9). American Cancer Society recommendations for prostate cancer early detection. Atlanta: American Cancer Society; 2012. Available: www.cancer.org/cancer/prostatecancer/moreinformation/prostatecancerearlydetection/prostate-cancer-early-detection-acs-recommendations (accessed 2012 Nov. 1). Prostate Cancer Risk Management Programme. London (UK): National Health Service; 2013. Available: www.cancerscreening.nhs.uk/prostate/index.html (accessed 2014 Sept. 9). Prostate Cancer Canada — PSA recommendation: know your number. Toronto: Prostate Cancer Canada; 2013. Available: http://prostatecancer.ca/getmedia/f99f7d19-2f3a-44ad-9af9-dc4473b2dc21/PCC-PSA-Position-2014-final-v2_1.pdf.aspx (accessed 2014 Sept. 9).
. Early detection of prostate cancer: AUA guideline. Linthicum (MD): American Urological Association; 2013. Available: www.auanet.org/common/pdf/education/clinical-guidance/Prostate-Cancer-Detection.pdf (accessed 2014 Sept. 9). Clinical Guidelines Committee of the American College of Physicians. Screening for prostate cancer: a guidance statement from the Clinical Guidelines Committee of the American College of Physicians. Ann Intern Med 2013;158:761–9. Position statement. Prostate cancer screening in Australia: joint key messages. Sydney (Australia): Cancer Council Australia; 2010. Available: www.cancer.org.au/content/pdf/CancerControlPolicy/PositionStatements/PS-Prostate_Cancer_Screening_Joint_key_messages_%20published_May2010.pdf (accessed 2014 Sept. 9).
. Prostate’s PTEN diagnosis. SciBX 2011;4(9).
. PCA3 sensitivity and specificity for prostate cancer detection in patients with abnormal PSA and/or suspicious digital rectal examination: first Latin American experience. Urol Oncol 2013;31:1522–6. Mitomics launches flagship product – Prostate Core Mitomic Test™ [press release]. Mitomics Inc.; 2011 Mar. 31. Available: www.mitomicsinc.com/media-center/press-detail.php?id=8 (accessed 2014 Sept. 9). MDxHealth announces results from the ConfirmMDx(TM) for prostate cancer test studies presented at the 2013 ASCO Genitourinary Cancers Symposium [press release]. MDxHealth; 2013 Feb. 18. Available: www.mdxhealth.com/news-and-events/press-releases-and-events?detail=1678617 (accessed 2014 Sept. 9).
. NADiA ProsVue prostate-specific antigen slope is an independent prognostic marker for identifying men at reduced risk of clinical recurrent of prostate cancer after radical prostatectomy. Urology 2012; 80:1319–25.
. Prediction of significant prostate cancer diagnosed 20 to 30 years later with a single measure of prostate-specific antigen at or before age 50. Cancer 2011;117:1210–19.
. Strategy for detection of prostate cancer based on relation between prostate specific antigen at age 40–55 and long term risk of metastasis: case– control study. BMJ 2013;346:f2023.